Enjoy an all-inclusive experience just steps away from the legendary Madison River. The location simply can't be beaten: the lodge is situated at the center of the famous Upper Madison " 50-mile riffle". 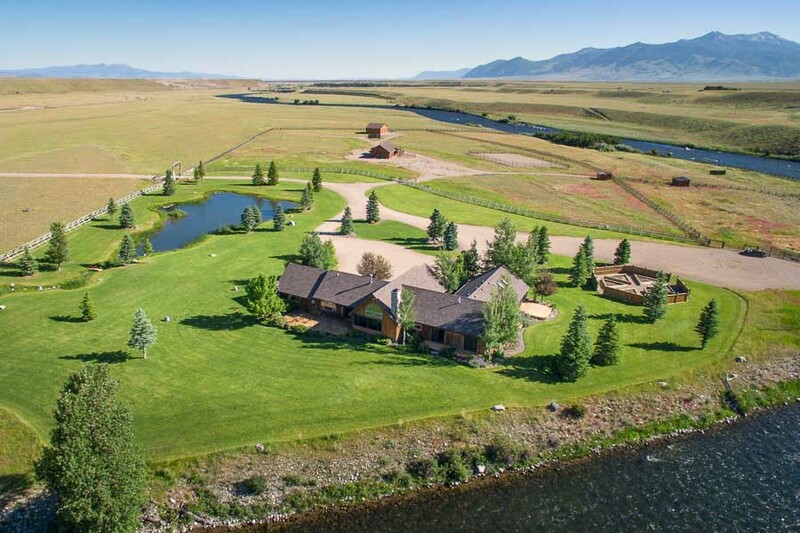 The river bends around the property and anglers can cast a line at their convenience. Each guest room has its own private bath and walkout patio overlooking the river. The lodge is surrounded by protected public BLM lands that adjoin the Wall Creek Wildlife Management area which is home to abundant wildlife. You won’t have to worry about neighbors and can enjoy the private feel during your stay. The legendary waters of Yellowstone Park are only one hour away and the trophy dry fly fisheries of Hebgen Lake are just 45 minutes upstream. A longer drive will land you on the Ruby, Jefferson, Gallatin or Missouri Rivers. This traditional style lodge has a classic look and warm feel with its warm wood accents and stone fireplaces. The huge back decks provide amazing views upstream along the river and surrounding mountains. The private setting, incredible access, and warm and inviting staff make this a truly special location. Enjoy culinary cuisine for each meal prepaid by a private chef starting with a fulfilling breakfast, then a sack lunch while on the river. After a memorable day of fishing arrive at the lodge to appetizers, wine and beer ready for your consumption, followed by dinner with a view overlooking the Madison River. For a single guide to client ratio add $280 per day. Equipment use, all tackle on guide trips, wader rentals, all meals, guided fishing, private access to the Madison River. Airport Transfer – We can arrange airport transfers for an additional cost of $260 for the first 2 in a round trip shuttle plus an additional $40 per person beyond the first 2 up to a max of 5 per van. Yellowstone National Park Fishing License – If you plan to fish in Yellowstone National Park a different license is required. Anglers 16 years and older can purchase a three-day ($18), seven-day ($25), or season ($40) permit at all ranger stations, visitor centers, and Yellowstone Park general stores. Permits are also available at Madison River Lodge. Anglers 15 years of age and younger may fish without a license when supervised by an adult or may obtain a free permit signed by a responsible adult to fish without direct adult supervision. No state fishing license is required in Yellowstone National Park.